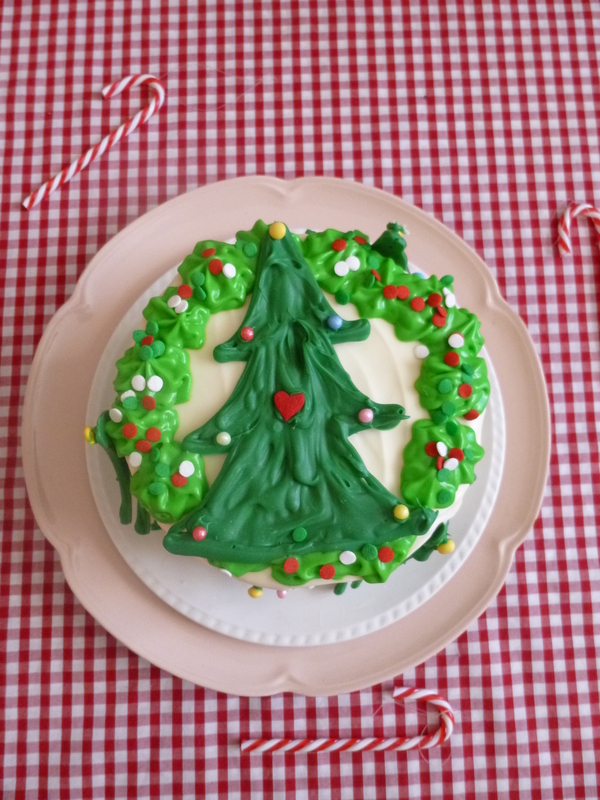 … aka a the most Christmassy cake in the world! As you may have guessed from my festive cookie sandwiches, Christmas is all about red and green for me (well, and gold and silver and white too…). I don’t like Christmas cake (sorry! ), mince pies (disgusting) or brandy butter so I have to go for a cake that LOOKS like Christmas. Oh, and tastes delish too. 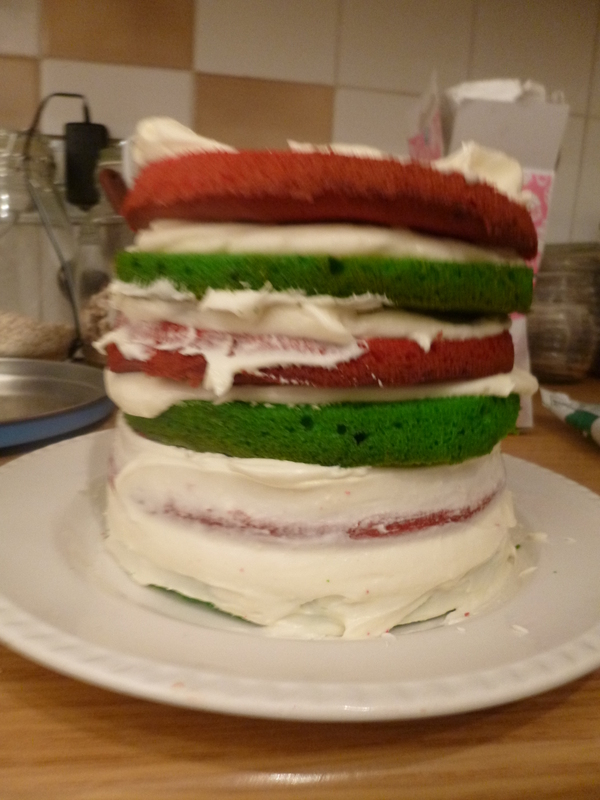 And I’m going to venture to say that my six layer red and green Christmas cake will get A LOT more gasps than your raisiny old Christmas cake…. 6 disposable foil baking tins (you can get these in supermarkets and Wilko’s). Alternatively, use regular baking tins, but you’ll have to cook in three batches of two, assuming that you only own two cake tins of the same size. The disposable tins I used were approx. 6 inches across. Mix your very soft butter and sugar until fluffy and light, and add the eggs one by one – at this point, the mixture may look a bit curdled, but don’t worry – just add the flour and vanilla and press on. Divide your mixture into two, and mix red food colouring into one bowl and green into the other, and then divide up into 6 tins. Cook at 180 degrees/gas mark 4/350F for 12-20 minutes until a toothpick inserted into the middle comes out clean. Leave the cakes to cool and make your cream cheese frosting. Beat your very soft unsalted butter, and add the icing sugar 300g at a time, sifting before adding it to the mixture. Once the mixture resembles buttery crumbs, add the cream cheese, and mix until the frosting is smooth and thick – if there are any bumps, just keep mixing. Store in the fridge until you’re ready to use. To frost your cake, first apply a crumb coat and leave in the fridge until set. If your layers are wobbling around, allow the first two, and then the second two layers to set before adding the last two. 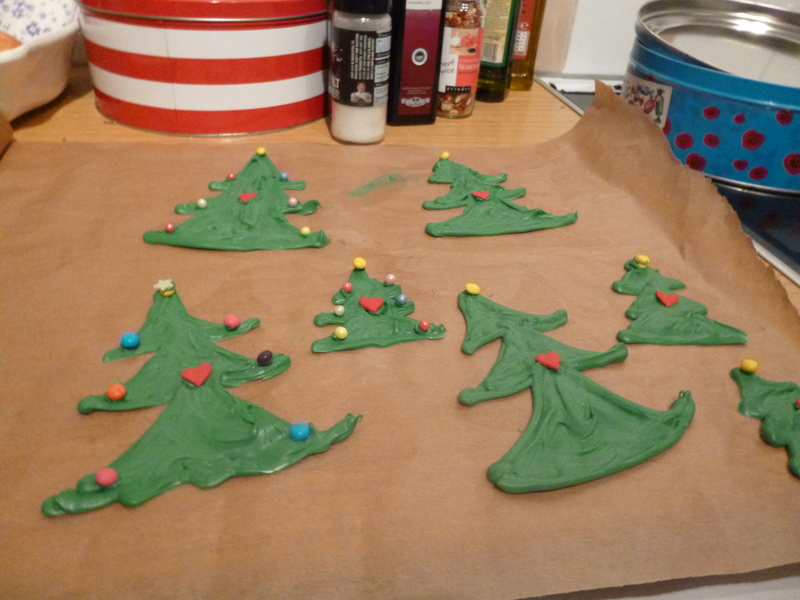 Once the crumb coat is completely sealed and firm, add a second coat (and third if necessary) and top with the green candy melt decorations. To make the candy melt trees, melt your green buttons in a bowl in the microwave, stirring every 30 seconds until melted. Spoon into the bottom corner of a ziploc style plastic sandwich bag, gathering the other end like a piping bag, and then snip off the corner. Pipe Christmas tree shapes, and then fill in the middles. Smoosh in sprinkles to be the decorations. Leave to set for around 20 minutes, or pop into the fridge. I hope this cake makes you feel as festive as it does me! Shhhh…. I don’t like Christmas cake either. Not a huge fan of mince pies. Your cake looks like festive fun fun fun. I can imagine it being served on the festive table in Whoville. A stunner! Thanks Lucy! I’m glad that it’s not only me! Hi I can’t help but feel like a fool asking this. In the recipe for the layered Xmas cake it says up to 40ml of skimmed milk in the ingredients list but I can’t see anywhere in the method of when to add the milk in? Thank you Laura – you’re very kind! 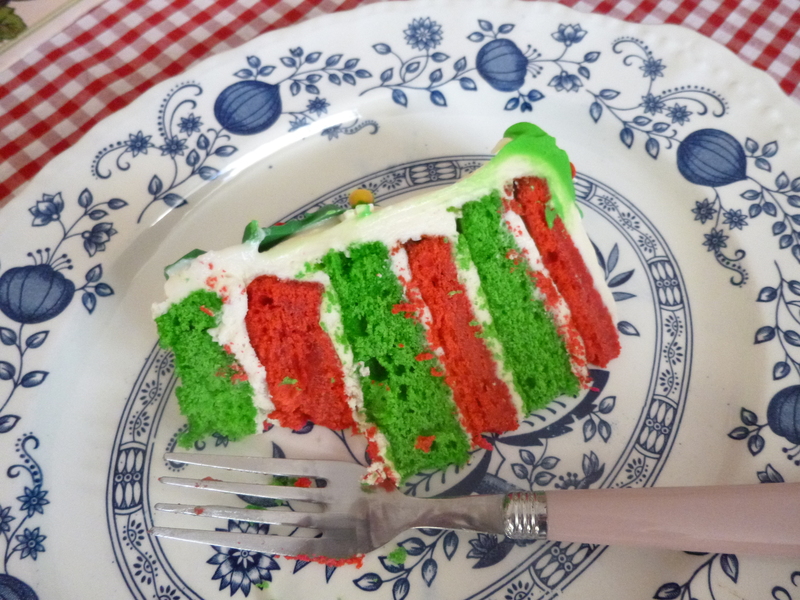 This cake looks so Christmassy! I am going to try making it myself – how much food colouring did you need to use to get such a good strong colour? Thanks Gracie! 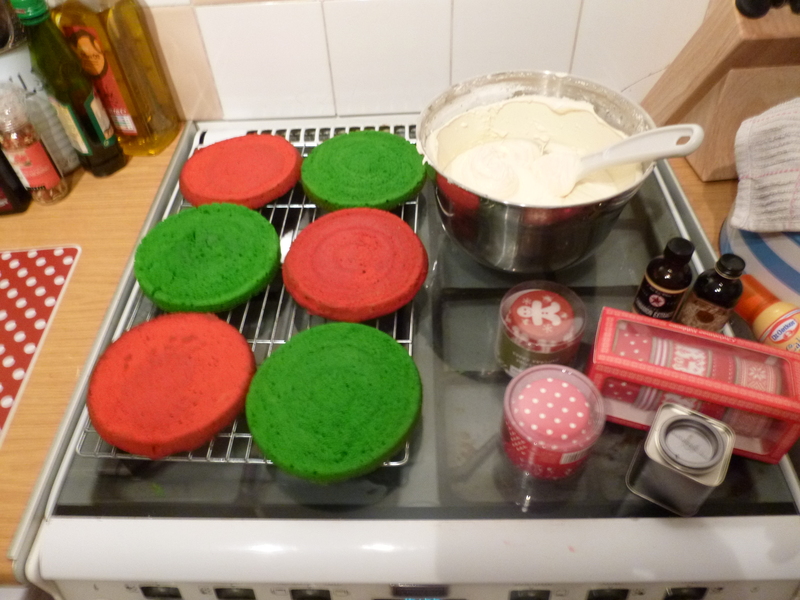 I used gel food colourings, red extra by Sugarflair and green from the asda home2bake range. I prob used about .5 – 1 tsp of each. I wish I was hungry enough on Sunday to tackle a piece of this – looked even better in real life!! Thanks! Wish there was some left now! This is unbelievable and so gorgeous! I want to hire you to bake for a Christmas party! Thanks Laura, glad I’m not the only one! How I love cream cheese frosting – a guilty pleasure. I’m pretty sure that’s the reason I keep making recipes featuring it! Wow wow wow just wow!!!!!!! 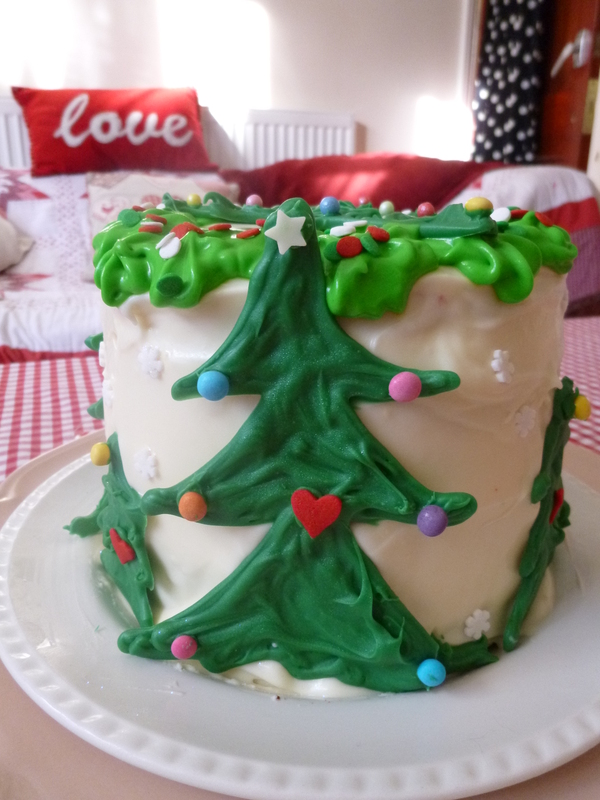 You are right…lets through all the boring traditional Christmas cakes in the bin!!!!! wonder if I can convince my rents to drop the fruit cake this year! Thanks Emma! Of course it is, thanks for that! Sorry but I had to stop reading when you said you didn’t like Christmas cake. It is my favourite in the whole world! My mum makes me a separate one every year after I started taking off for university with big chunks of hers. It’s the one thing I haven’t made myself yet – and don’t really have any inclination to while she is still supplying! 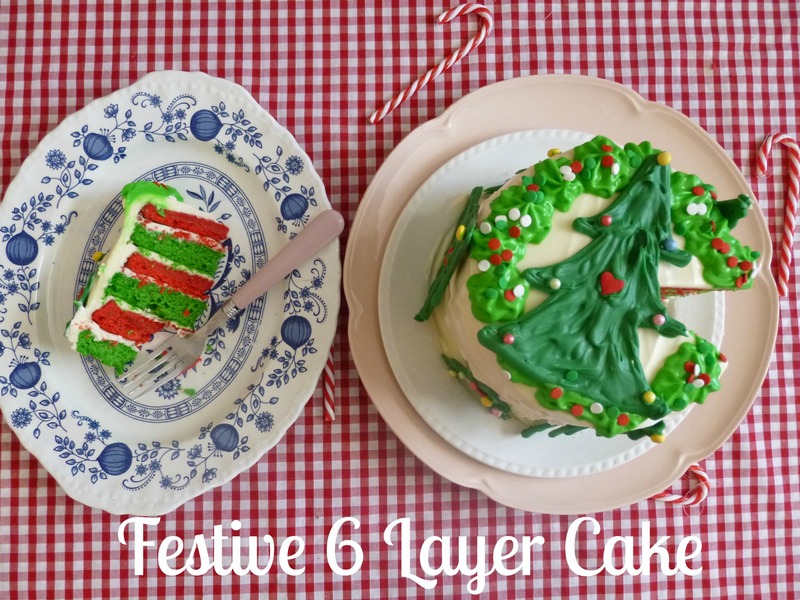 Hey Buddy!, I found this information for you: "Festive Red and Green Six Layer Cake with Cream Cheese Frosting". 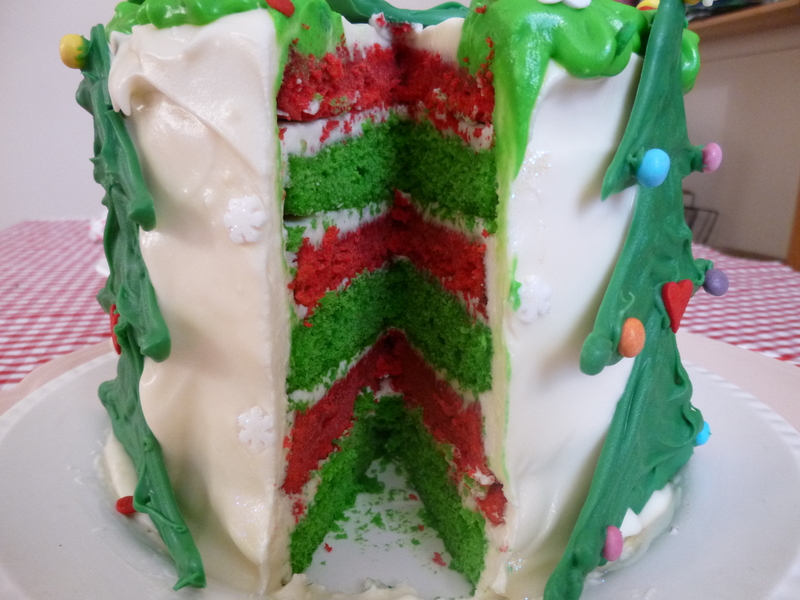 Here is the website link: https://kerrycooks.com/festive-red-and-green-six-layer-cake-with-cream-cheese-frosting/. Thank you.